Southern California Graphics services are justifiably considered the gold standard (Gold Ink Awards, 2009). Sought out by the industry elite, from top studios to national corporations, Southern California Graphics is a standard-bearer for the print medium. Southern California Graphics has been developing print solutions for over 40 years hand crafting each and every single piece of print media that comes through the door. There is no job or project that is to big or to small for Southern California Graphics. Whether you are doing big customized project or looking for elegant business cards for your team, we make sure we handle all of our commercial print needs with care. Careful, expert attention is paid to each print product. Our methodology, efficiency and professionalism elevate the integrity of the work. We are commercial printers with class. We prize the artistry and technology of the printing process, and embrace both the legacy of our craft and its modern innovations. We value our customers’ creativity and needs, tailoring every part of the process to their requirements – as per our motto, service without boundaries™. Offset Lithography – Printing on almost any flat surface, using printing plates. Offset lithography offers beautiful quality with fine detail, and is one of the most widely used printing methods in the world. We also offer stochastic lithography, which spaces printing dots according to tonal value to create a high quality image. UV Lithography – UV lithography uses light and chemicals to produce an image. UV lithography produces incredibly detailed patterned and images but can only be applied to flat surfaces. To produce successful UV lithography pieces requires the type of extremely clean operating conditions that Southern California Graphics maintains on a daily basis. 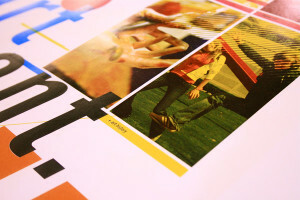 Digital – Printing directly from a digital file onto a surface or product. What sets Southern California Graphics digital print apart is its incredibly high quality. Digital print allows for shorter runs and complete individualization [see Variable Digital Print page]. Material Variety – Southern California Graphics prints on paper, static cling (great for glass window signage), styrene (a flexible and durable plastic that reproduces brilliant color), and many more surfaces and substrates, including Soft Touch Aqueous Coating. We use GRACoL processes and standards in all of our offset lithography work. Southern California Graphics is a G7 Certified Master Printer.